Vancouver, British Columbia--(Newsfile Corp. - May 16, 2018) - Jaxon Mining Inc. (TSXV: JAX) (FSE: OU31) (OTC: JXMNF) is pleased to announce that its first phase exploration program of the 2018 field season will commence in the beginning of June. While detailed re-interpretation and analysis of geophysics data from last year's Fall program continues at the Max project, Jaxon will initially focus on the newly discovered Red Springs target within the same Hazelton project area, 50 kilometres north of Smithers in the Skeena Arch of British Columbia. To define the extent, distribution and geometry the of high-grade gold mineralized breccia occurrences at surface. To establish high priority drill targets for a scheduled Summer 2018 drill program. Prospecting at the end of the 2017 field season identified a suite of high-grade gold bearing breccias spatially associated with argillic and sericitic alteration (see February 20, 2018 news release). 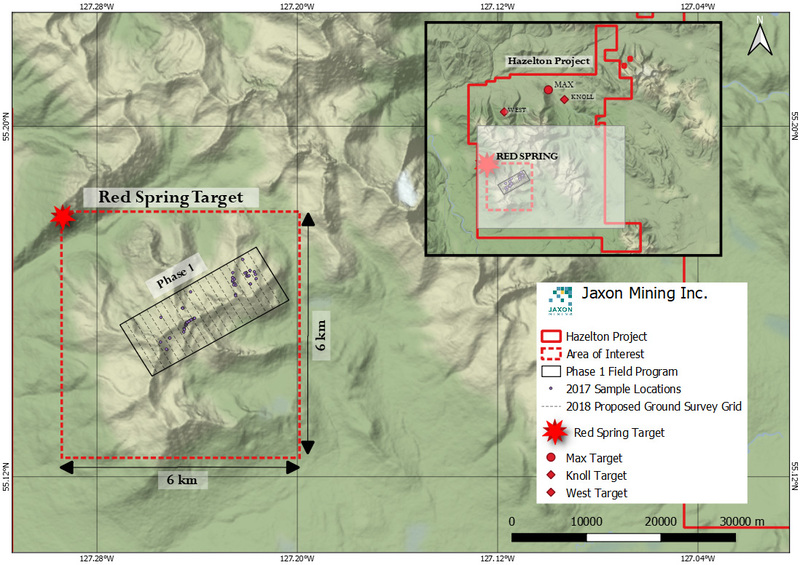 Although snow cover limited the opportunity to do extensive fieldwork, a total of 49 surface samples were collected from tourmaline breccia exposures on the western side of the Red Springs alteration zone, 26 of which were gold-bearing and 8 of which contained gold ranging from 10 g/t Au — 33 g/t Au. Notably, the 33 g/t sample was a composite, comprising 12 grab (in-situ) samples over an 8 square-metre area.